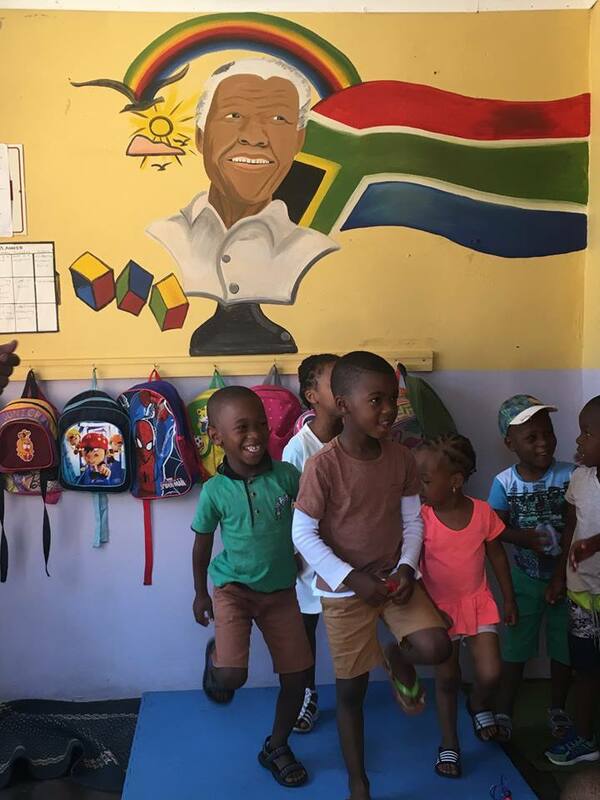 During the last few months, significant progress has been made in several areas of The Thoughtful Path programme in Munsieville, and it is now gaining momentum to fully empower the community to change the way it cares for its children forever. With a team from the Department of Health now operating at the Hope Park Children’s Health Campus, we have so far vaccinated 138 infants under five, and 92 children over five. Two ECD centres brought all their children to the unit for vaccinations! In addition, one of the nurses identified three severely malnourished children and referred them to the clinic dietician who comes to Hope Park every Tuesday and to the Nutrition Unit for ongoing support. Read more here. 65 family vegetable gardens installed supporting 360 people. 3 school vegetable gardens built serving 3250 children. 2 Early Childhood Development Centres rebuilt. 5 pre-school centres redecorated with beautiful, educational murals. 4 children’s playgrounds renovated and one created from scratch. 2 children’s health units improved with unique wall paintings and signage. 1 'Children First' Home Safety Festival delivered. Although they have now returned to the UK, the young people from Chesham have left a lasting legacy in Munsieville. In one week the hardworking Chesham Churches Youth Team built 60 family vegetable gardens and planted three huge school gardens. 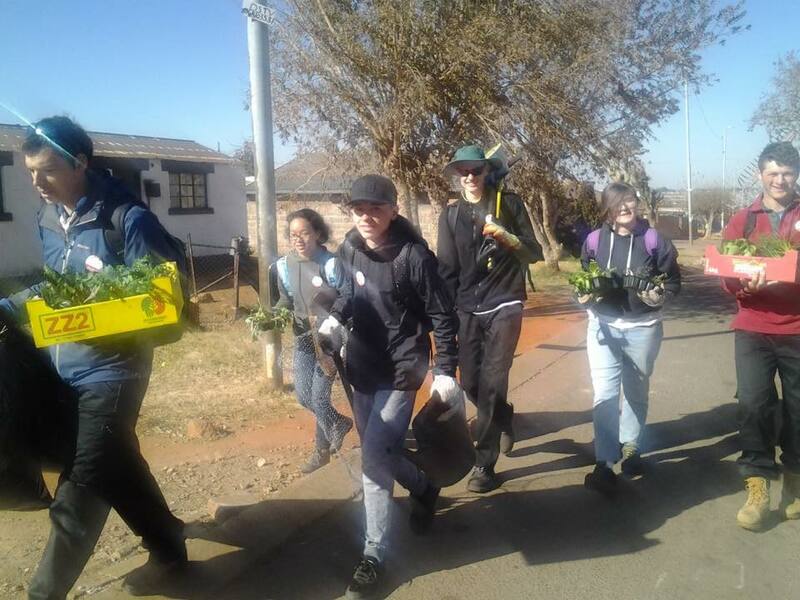 On 18 July they were joined by volunteers from power generation company, Eskom, marking the 100th anniversary of the birth of Nelson Mandela by serving the community. School kitchens often struggle with a very limited budget, the vegetable variety is usually restricted to cabbage and onions. The new beds contain spinach, beetroot, lettuce, kale and a wide variety of healthy indigenous leafy vegetables. 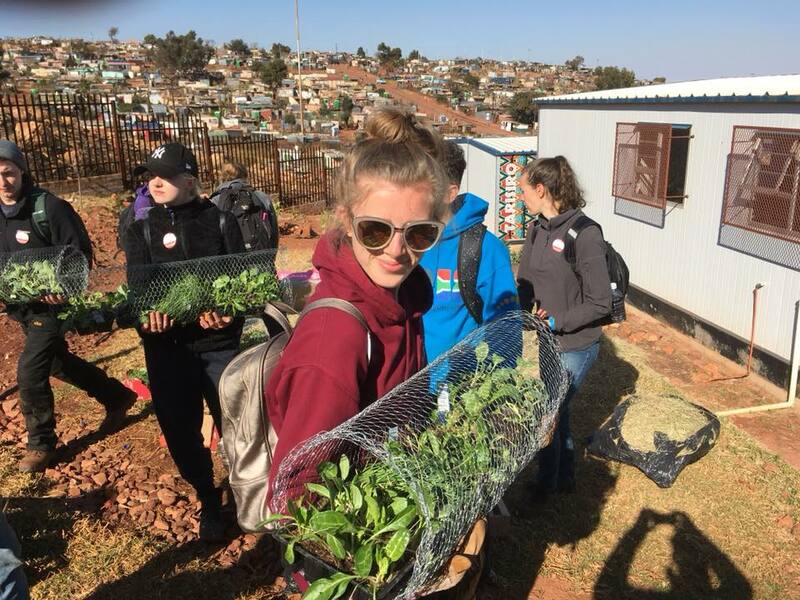 Twenty family vegetable gardens were built in the old part of Munsieville during another fantastic day with the Youth group from the Chesham churches. Whilst the young people worked tirelessly to make sure the gardens are in perfect shape, they also built relationships with the families in their homes. These drought resistant gardens will provide fresh vegetables all year round and contribute to a healthy diet and improved nutrition. Another successful plant sale in Chesham this Sunday raised more funds for the upcoming trip to South Africa by 27 young people from the town. The group will be working in #Munsieville to build vegetable gardens, refurbish early childhood development centres and help run a home safety awareness campaign. Look out for more updates in July! On World Environment Day 5th June, we had an amazing workshop conducted by Michael from Food and Trees for Africa. 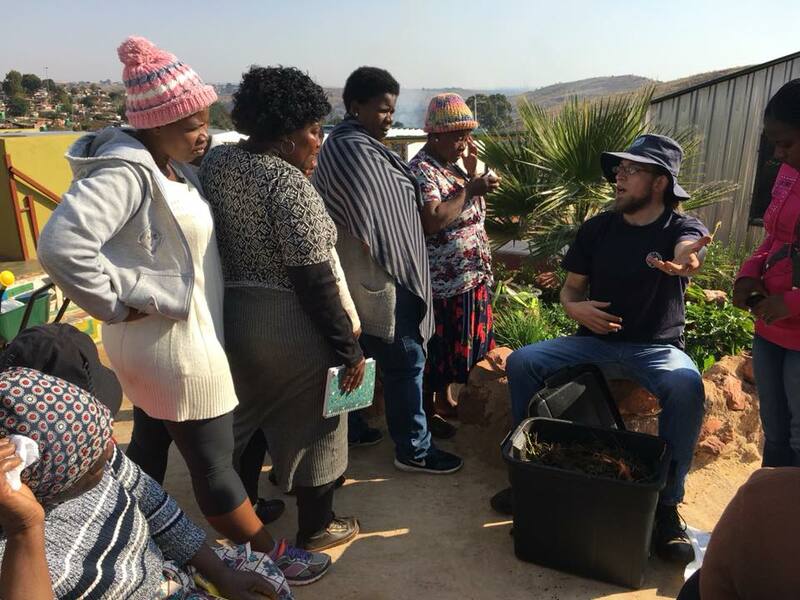 He taught The Thoughtful Path team the principles of permaculture, a life in harmony with community and nature, how to avoid waste and create highly productive food gardens. This day was sponsored by the Deutsche Bank Foundation Sandton, thank you so much for your fantastic support! We are delighted to announce that Food & Trees for Africa (FTFA) https://bit.ly/1hsi6If will undertake an exciting project with The Thoughtful Path in Munsieville in June, to convert our ‘e-zone’ into a permaculture farm to be run by the community. FTFA will hold training workshops to demonstrate the effectiveness of permaculture processes, which work with nature and the natural environment to produce vegetables without the need for synthetic insecticides and fertilisers. 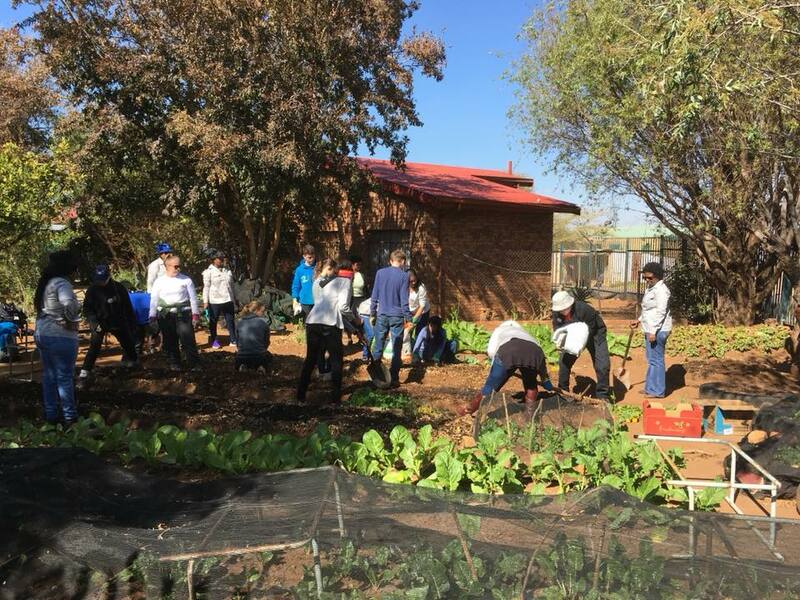 They will then come to Munsieville with a team of 30 staff from Deutsche Bank South Africa to work with the community in laying out and planting the farm. Check back next month for more photos! Sunday 22 April in London was the hottest marathon in its 38-year history, bringing record crowds of well-wishers onto the streets to cheer on the 40,000 runners. For Project HOPE UK CEO Paul Brooks, it was his toughest physical challenge to date. But for him, the sore feet, aching muscles and creaking joints were well worthwhile as every step he ran netted 25 pence to help save the lives of vulnerable children in South Africa. “I have been overwhelmed by the love and generosity shown by wonderful people across the world, helping to raise £10,460” said Paul at the finish line. The money will buy materials to be used by a team of 33 young people and leaders from churches in Chesham, Buckinghamshire, travelling to Munsieville Township, near Johannesburg in July. The team will work with residents of the township to renovate dilapidated pre-school centres, build over 60 vegetable gardens and run a township-wide campaign to support householders in making their shack homes safe from fire, poisoning and other hazards that seriously endanger children. “It has been such a privilege for me to take part in the biggest road race on the planet and to carry with me the love, prayers and hopes of friends and sponsors from across the globe”, says Paul. “From the bottom of my heart, thank you for your amazing support and every penny donated and each message of encouragement!" Paul Brooks, CEO of Project HOPE UK has just reached his 65th birthday and, to celebrate, he will be running the London Marathon on 22 April. He is aiming to raise at least £10,000 for a special project in Munsieville, South Africa in July when he will be joined in the township by 36 young people from his home town of Chesham in Buckinghamshire, to help transform the living conditions for hundreds of children. Over two weeks, the team, which is covering all its own travel and accommodation costs, will install food gardens at homes occupied by malnourished children, help refurbish a number of pre-school, early years development centres, and run a campaign promoting proven methods of eliminating serious risks in shack homes, such as fire and poisoning. Paul aims to raise the £10,000 needed for the materials for this life-saving mission. Students from Monash University South Africa recently organised a Health Fair for the children of Munsieville, with education and activities on nutrition, oral hygiene, physical activity, bullying and abuse, sexual health, drug abuse, safety and career guidance for teenagers. The fair helped to raise awareness of the issues faced by the children every day, and give them practical knowledge to increase their chances of growing up into healthy, productive adults. Hope Park children’s health campus in Munsieville, South Africa, is now up and running, transforming the health prospects of over 15,000 children and young people. For more than a century, Munsieville children have suffered poor health and low life-expectancy. Many have struggled to access even basic health services often subjected to risky ‘remedies’ from traditional healers. Now they have easy access to a range of health and well-being services without equal in South African townships. Hope Park is more than a stand-alone clinic - it is an integrated facility with a network of health and well-being practitioners, working together with a commitment to give every child the opportunity to grow into a healthy, productive adult. Hope Park was made possible by the support of The Property Race Day and has separate facilities for infant health, child health and teenage health, a dedicated child nutrition centre, provided by Norton Rose Fulbright and a multi-purpose children’s education and support centre. The Gauteng Police Department raised funds on their annual cycle race for The Thoughtful Path, #Munsieville and also donated four white boards for the health clinics and nutrition centre at the Hope Park. Thank you for your support! The case of Hannah and Moputo kept the Thoughtful Path Team on their toes for many weeks. The 4 week-old twins from Mozambique came into our care in February 2017 after their 18 year-old mother was admitted to hospital with severe post natal depression and a heart condition. Before that, Moputo had to be resuscitated after drowning in the bath tub, only the attention of a neighbour helped to save his life. Taking babies into home care is not something the team would normally do, but these circumstances were particularly difficult, especially after the mother passed away in hospital. The father, whose stay in South Africa was illegal, had to travel to Mozambique to renew his passport and re-enter the country legally, otherwise he would not have been able to take the twins and the corpse of his wife back home. Moputo and Hannah remained in the homes of our team members for 6 weeks at night, and were taken care of in one TPM trained ECD centres during the day. They gained weight and were in perfectly healthy condition when the team handed them over to the grateful father and his family, all set up for a long trip to Northern Mozambique where they will grow up with extended family. The father expressed his gratefulness and said: "I have worked with many NGOs over the years, but I have never experienced such a deep level of care and compassion". This month, selected primary schools in the UK have received their special ‘You Grow-They Grow’ packs, containing everything needed for children to participate in an exciting experience growing vegetables, learning about plant science, establishing a direct link with children in Munsieville, South Africa, and supporting their efforts to grow their way out of malnutrition. The 34 schools are part of a trial involving over 8,000 children through the coming Spring term, helping to shape a unique educational project due for launch in late 2017. 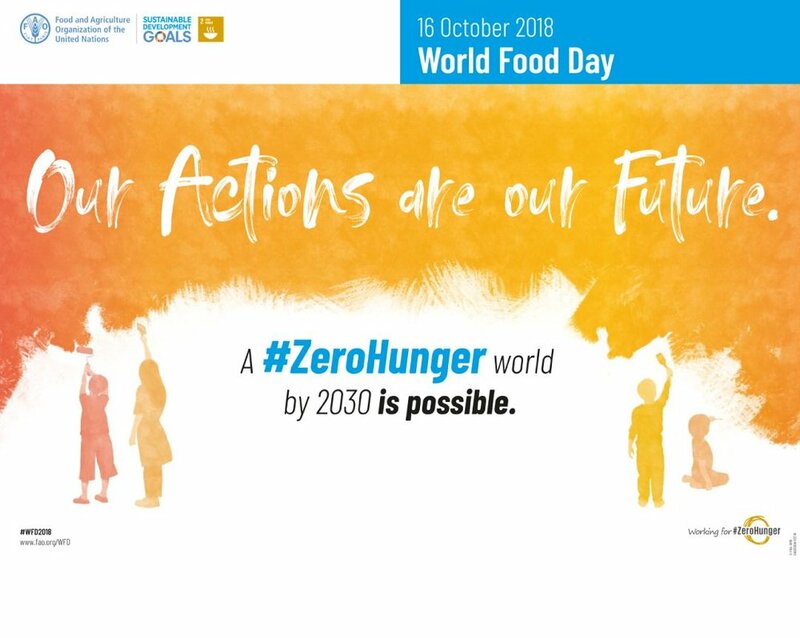 It is part of our strategy to help address the malnutrition blighting the lives of countless children in the developing world. Although the application process for participation in the school trial is now closed, there is a host of exciting resources available for FREE download on the 'You Grow-They Grow' web site, including worksheets, lesson guides and videos. Our project director Betty Nkoana has been awarded with the Gauteng Province 'Vita Basadi Community Builder of the year' prize. The ceremony took place on Wednesday, 31 August 2016, at the Gauteng Legislature in Johannesburg City Hall. The awards are running in their second year and honour women of Gauteng who have made a difference in their communities without recognition or reward. Our long term partner, the Child Protection Unit in the police service and its representative Captain Paula Terblanche also received an award. http://gpl.gov.za/tag/vita-basadi-awards/. We are very proud of Betty and the team in Munsieville! The ever-popular Thoughtful Path 'No Child Is Left Behind' project has exceeded the numbers of children registered in previous years following the opening of the new Fhulofhelo centre. The new bright and colourful environment attracts children and their parents alike, so the current group for this programme has 25 children aged from 4 to 8. The project started in 2014 for immigrant children who had no access to early childhood development, to provide learning opportunities, teach them about colours, numbers, health and exercise and to give them all the language training they need to be ready for primary school. Thoughtful Path staff also help the parents and caregivers with school enrolments and overcoming other bureaucratic hurdles. Thanks to donations from our trustees and staff, we have been able to build a new Fhulofhelo Centre in Mshenguville, Munsieville's informal settlement, to be used for after school care and activities such as baby bathing classes during the day. The Thoughtful Path team and volunteers from the community worked hard over two weeks to construct the centre and landscape the grounds, including creating a demonstration vegetable garden for our 'You Grow, They Grow' programme. The centre is now big enough to separate the children in age groups to give all of them the best possible support. The operating hours will be longer than before so there is always an open door. The outside arena is now child friendlier and safer and wheelchair access ensures that there is no barrier for anyone. Look out for more news on landscaping improvements over the coming months. The charitable foundation set up to expand the extraordinary legacy of rock legend, Freddie Mercury, has announced a grant that will support the 'Botshabelo Child Crisis Line' over the coming year. Funds from the Mercury Phoenix Trust will cover the cost of the toll-free telephone line, training, and the costs of supporting the volunteers who answer calls from children in distress in Munsieville 24 hours a day. The Botshabelo Child Crisis Line, believed to be the only service of its kind in South Africa, being dedicated to the care of children in one specific location and operated by local people, was launched as part of The Thoughtful Path Munsieville in 2014. In the past 18 months, over a 1,000 calls have been received and many serious cases of child abuse and neglect have been forwarded to professional agencies working in partnership with the Project HOPE UK initiative. The first guidelines and take-home factsheets of the 'Pathway to Health' community health curriculum are now ready for briefing community members - information on HIV/AIDs, tuberculosis and malaria has been prepared for caregivers of vulnerable children and members of The Thoughtful Path hubs, highlighting preventative action and timely care-seeking. Additional topics to be covered include common childhood illnesses, mental illness and nutrition and hygiene. In Munsieville, Dr Eric Mukanzila (a local GP) and Elliot Nesta (Thoughtful Path project coordinator) make sure that everyone attending the Health Curriculum workshops has a thorough understanding of the common illnesses that are relevant to the Munsieville community. Tuberculosis, HIV/AIDs, malaria, meningitis, we have all heard these words before and we know all about it...... but do we really? From now on, these community members will take their knowledge into the families living in Munsieville to raise awareness and eradicate myths that are often spun around the cause and symptoms of diseases. Mama Silvia has been working with The Thoughtful Path since 2011, initially looking after street children. 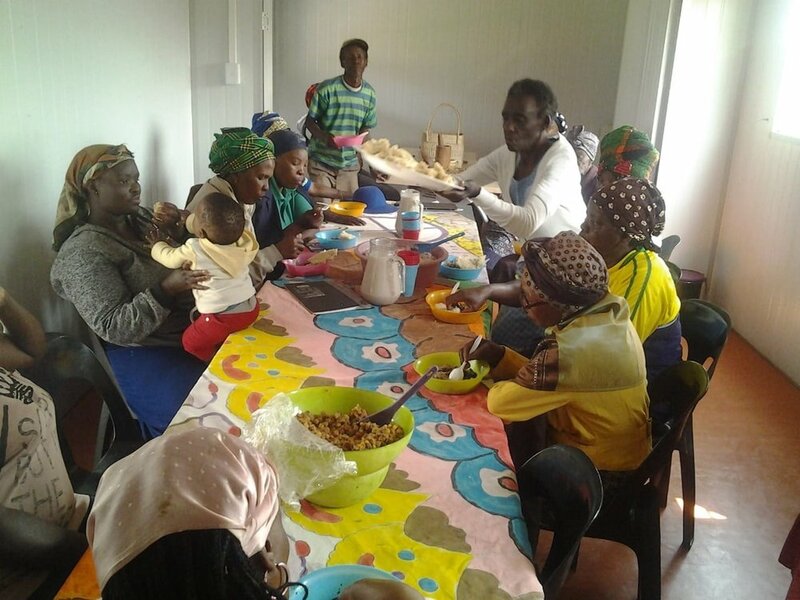 This involvement with The Thoughtful Path encouraged her to start an ECD centre, which covered the basics like cooking for the children and washing their clothes. Silvia then joined the Safe and Sound ECD Level 4 training and is now a certified ECD practitioner and able to speak in public (she was previously very shy). Silvia has also recently joined the Munsieville bakery project which will produce fresh bread for the community. Mama Louisa runs an ECD centre in Munsieville for children aged 0-4 years. She organises daily activities to develop the children in her care, including structured play and songs to learn numbers, colours, days of the week, staying healthy and safety in the home.